(CN) – The phone buzzed on the nightstand next to me. I awoke and glanced at the alarm clock. 4:34. AM. I picked up the phone and looked at the screen. My editor. My knee-jerk reaction was to throw the phone across the room. This is not a political column about a nuclear crisis and whether our president can answer the call. This dispatch is about a different kind of crisis: the frightening prospect of having to wait for parking and then wade through throngs of crowds, many of them fresh off tour bus hell, in order to “enjoy” a national park. “Hey Bill,” I grumbled into the phone. I hung up and realized I probably wasn’t going to be able to get back to sleep. I called Thresa in the other room. She didn’t answer. After righting myself I stumbled to her room and knocked on the door. “Ugh, you’ve got to be kidding me!,” she yelled from behind the door. “Hey, you did this!” I rejoined. My friend had met us in a taxidermy-festooned grill and saloon in the western-themed tourist town of Cody, Wyoming the night before for some grub before we attended the nightly rodeo, featured in this dispatch. She had driven down from Bozeman, Montana to join us on a weekend trip to Yellowstone National Park. We’d come up from Cheyenne, Wyoming after a hiring and training trip in the southern part of the state. I told her we agreed we could be ready to go by 7:30. “You guys are killing me,” she muttered. Bill explained that he didn’t think he could get up much before that. I started to say we’d still get to the park early enough, but I remembered that Bill, his internal clock still thrown off from a trip to Japan that he’d returned from before meeting us, had been emailing almost every day that week by 5:30 in the morning. “How about Bill just calls us when he gets up tomorrow? If he doesn’t call by 6:30, we should all just get up then and leave by 7:30,” I offered. “Alright,” Thresa said, but then added that she knew from experience that we should get to the park as close to daybreak as possible to beat the crowds. “You’re late,” Adam said when we pulled up to his hotel a few minutes after 5:30. Perhaps, but it was still dark. Approximately 45 minutes later, after passing through the entrance gates, we entered a stretch of park that had burned in a wildfire a few years back under a sky now lead gray. Trees with scraggly and still-charred limbs filled a field to the right. Bits of new green growth shot through the earth. 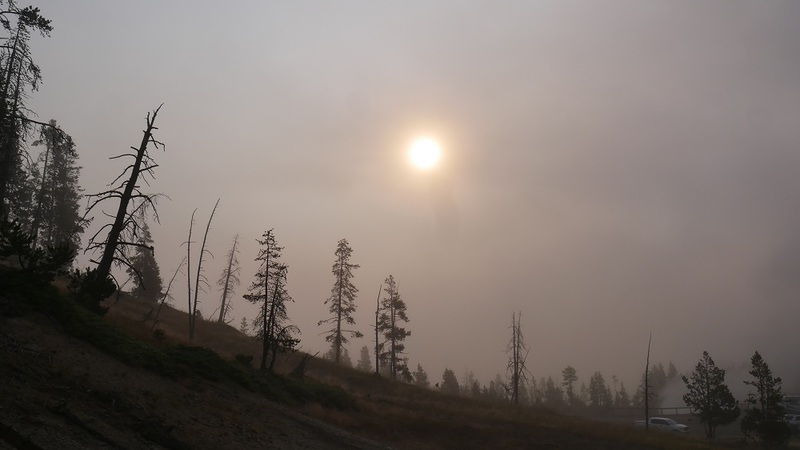 In my early morning fog, and the dark, I hadn’t noticed how smoke-choked the air was. 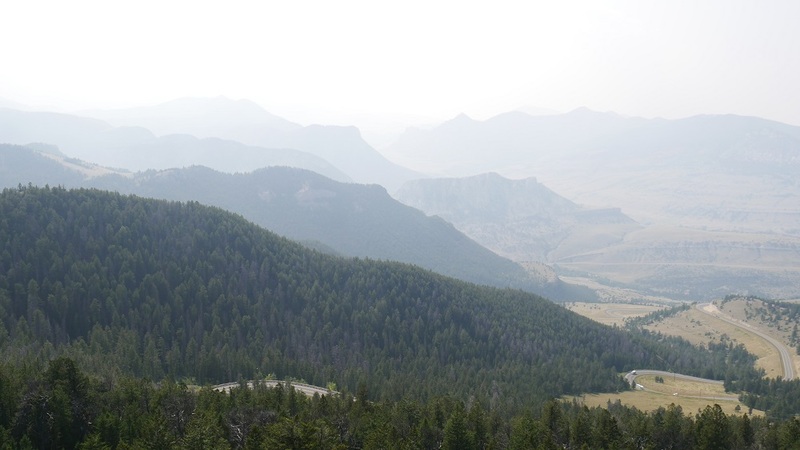 Though fires raged in parts of Montana to the north, the air quality on a given day depended on the direction of the wind. Today it blew south. 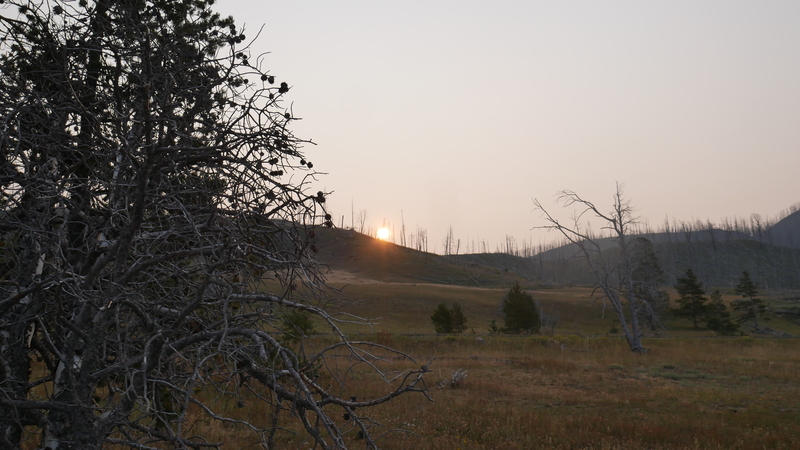 The sun rose as a tiny speck through smoke and gnarled branches. I had a vision of us as actors in the opening scene of some apocalyptic movie, making our way to a bug-out cabin deep in the woods, where we would be safe from a yet-to-be-defined menace. Then the first large tour bus came into sight, and I snapped back to reality. The traffic increased slowly as the morning grew long. 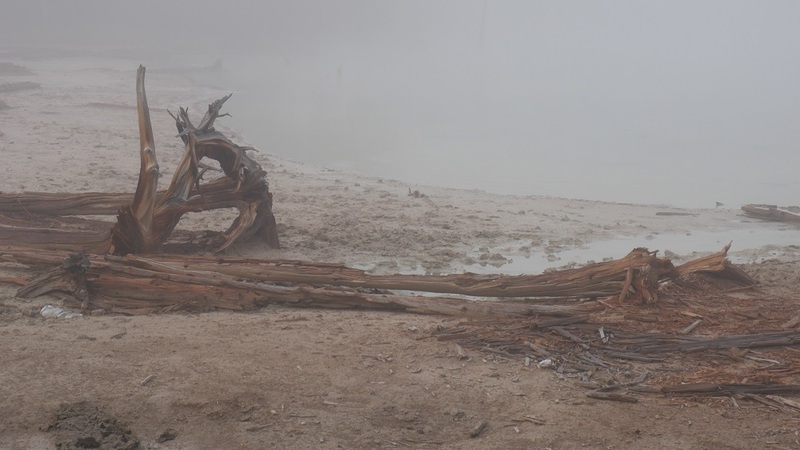 While we always found a spot in parking lots near sights of interest including geysers, waterfalls and one of the biggest cobwebs I’ve ever seen, more often than not by the time we left, at least one car would be circling the now-full lot. 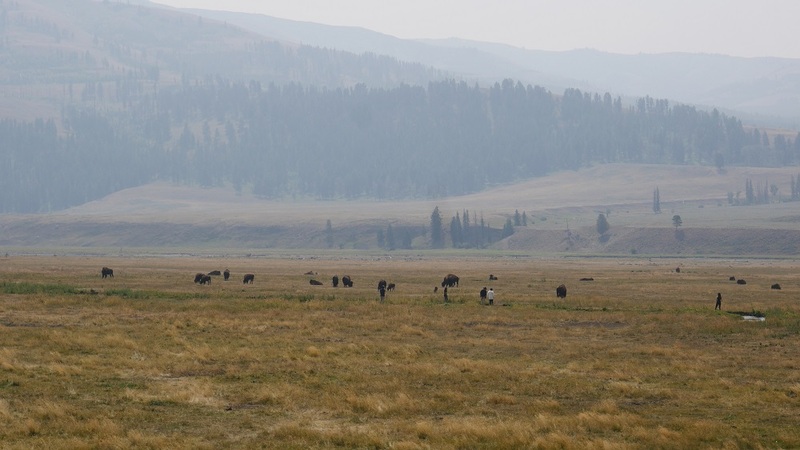 The smoke hung low on what should have been a sunny day as we descended in the early afternoon into the Lamar Valley, famous for the number and diversity of its wildlife that includes bison, elk, coyotes and grizzly bears. An animal raced at the car from the edge of the field, cutting behind us and in front of another car. We debated its provenance before somebody, I think it was Adam, declared it a pronghorn. Once in the heart of the valley, we pulled over for lunch. Though we considered eating at the car, Bill insisted on a picnic in a nearby field. Despite some reservations about the wisdom of such a move, Bill’s resolve won out. To be fair, we were hundreds of yards from the nearest wildlife-a large herd of bison-and a river ran between. But many bison had been there before. The numerous large piles of poop proved it. We managed to find a spot relatively devoid of bison pies to enjoy our baguettes and cold cuts. After lunch, Bill decided to go for a swim. We hiked the short distance through the brush, dung and rocks to the shallow, fast-moving river. Bill threw himself in first, followed by Thresa and then Adam. I inched forward into the icy water until it went up to my calves and then pitched forward, catching my fall with my hands. I submerged my head into the water, then immediately jerked back and jumped up, caught my breath and let out a loud yelp. That was enough cold water for one day, I thought, but almost immediately reconsidered as we trudged back and I felt the first beads of sweat on my forehead. We drove by the herd of bison a few minutes later. A small group of tourists had walked into the field and approached the animals. We took pictures of the other tourists taking pictures. 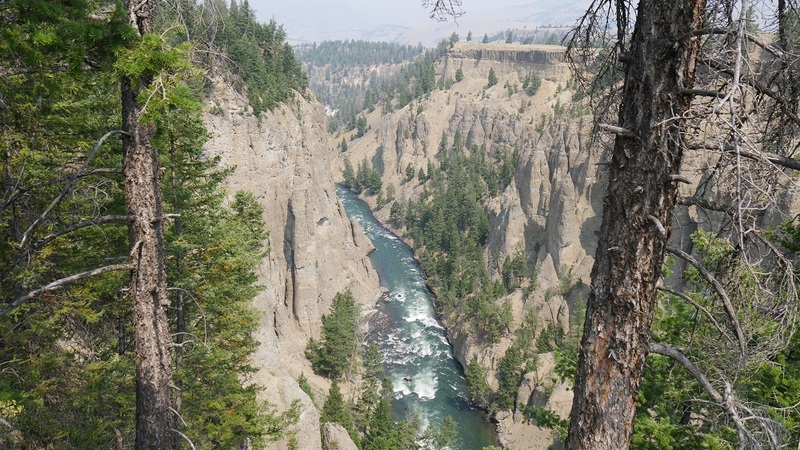 Only when reviewing them days later did I realize the small river cut between the tourists and the bison. But they were still way too close. At our next stop we had to navigate through a herd of humans to get to an overfilled lookout point. We quickly moved to a smaller outcropping with a slightly less spectacular view, but no people. We walked back to the car. A frustrated driver waited for another to pull out of a parking spot, a line of cars waiting behind. After winding our way out of the park and stopping for a quick drink and a bite just across the state line in Cooke City, Montana, we headed southeast back into Wyoming, the Beartooth Mountain range dominating the skyline to the north, the Absarokas to the south, Creedence Clearwater Revival blasting on the radio. We stopped a few times to take in the view of mountain peaks rolling into the distance, obscured and made more enticing by the smoke. Our twisted path descended slowly, eventually bringing us back to Cody. Then somebody, I think it was Adam, asked if we’d heard what happened in Charlottesville. White supremacists marched, waved racist flags and carried tiki torches, not bothering to conceal their identities. Counter-protesters showed up en masse. Somebody drove a car into the counter-protesters, seriously injuring many and killing one. Part of me wished that we had been heading to a bug-out cabin that morning. We could avoid confronting the ugliness that Charlottesville showed still festers in our country. No, we must face the menace if we are to progress. But first we had to find a place to eat. Courthouse News Service has provided daily coverage of the United States District Courts for Montana, Idaho and Wyoming for more than a decade and of Idaho state courts since 2008, which includes daily coverage of 28 state courts including the Ada County District Court. CNS began regular in-person coverage of Montana state courts in 2016, including in the counties of Yellowstone, Missoula and Lewis and Clark. Courthouse News began regular in-person coverage of Wyoming state courts earlier this year, including in the counties of Laramie, Natrona, Campbell and Albany. Named After: Ada Riggs, first pioneer child born in the area, and the daughter of H.C. Riggs, a co-founder of Boise. Ada County is home to Boise State University, whose football team plays on a distinctive blue field. 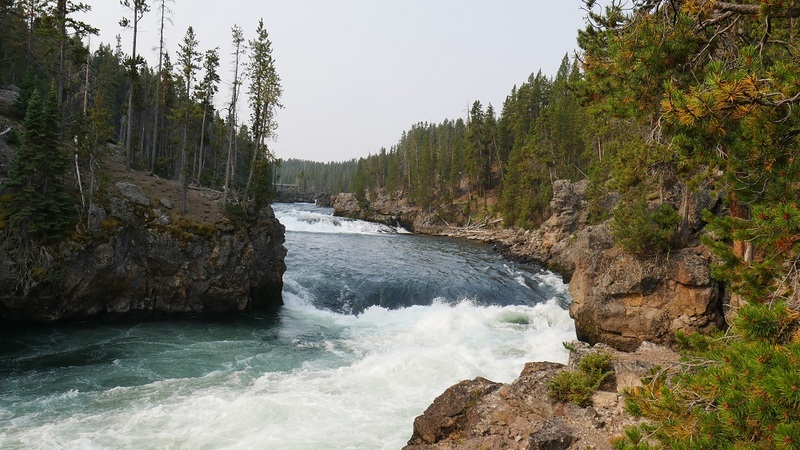 Named After: Yellowstone River, a tributary of the Missouri, the longest river in the country, which spills into the famed Mississippi River north of St. Louis. Missoula County is home to the University of Montana. Named After: Albert Gallatin, U.S. Secretary of the Treasury from 1801-1814. Bozeman is home to the main campus of Montana State University. Interesting Fact: Helena was founded by four men, known as the “Four Georgians.” The men arrived in the area after searching in vain for gold throughout western Montana, and decided to give their luck one last shot. They struck gold in downtown Helena on what is now a street called Last Chance Gulch. Word of their success brought other miners to the area. This bureau chief was told some were from Georgia, at least one written source claims all were from Georgia, but the clerk at the tourist information shack said none were and were so named because they used a style of mining known as Georgian. Interesting Fact: Laramie County is the least populated county that is the most populated county in a state. 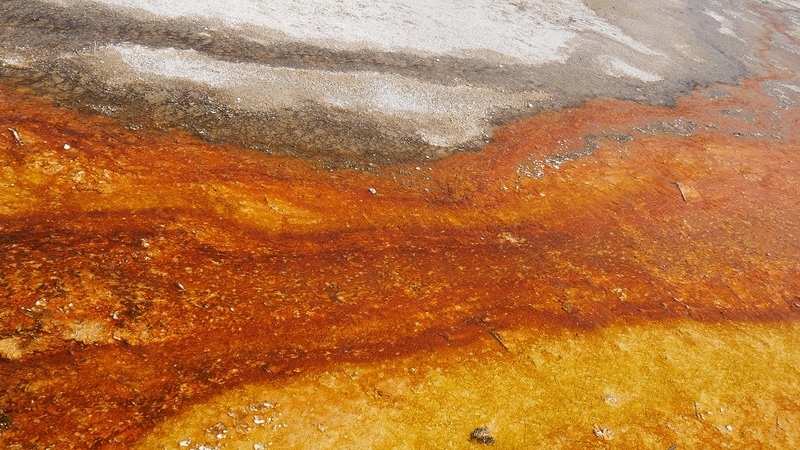 Named After: Deposits of natron found in the area. Natron is a mixture of sodium carbonate decahydrate and sodium bicarbonate.